Tuesday October 21st 1924 Here all day. All busy with sick folks. The girls had hard coal stove put up in afternoon. Sallie Sheeley buried today. Wrote Hattie. Wednesday October 22nd 1924 I went up town early, got some money. Stopped at the depot to see about trip home. Wrote and mailed a letter to Warner McCall. Edith did washing. I ironed all afternoon. Sick folks no better. 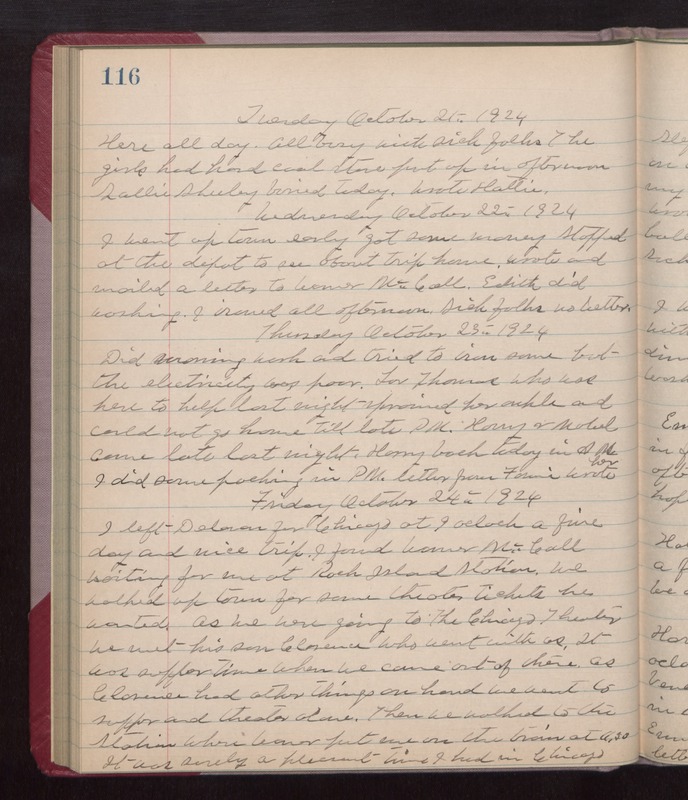 Thursday October 23rd 1924 Did morning work and tried to iron some but the electricity was poor. Lou Thomas who was here to help last night sprained her ankle and could not go home till late PM. Harry & Mabel came late last night. Harry back today in AM. I did some packing in PM. Letter from Fannie. Wrote her. Friday October 24th 1924 I left Delavan for Chicago at 9 oclock. a fine day and nice trip. I found Warner McCall waiting for me at Rock Island station. We walked up town for some theater tickets he wanted. As we were going to The Chicago Theater we met his son Clarence who went with us. It was supper time when we came out of there. As Clarence had other things on hand we went to supper and theater alone. Then we walked to the Station where Warner put me on the train at 11.30. It was surely a pleasant time I had in Chicago.